It's really wonderful how many large corporations are openly showing support for the LGBT community. Perhaps the most entertaining of these right now is Android. 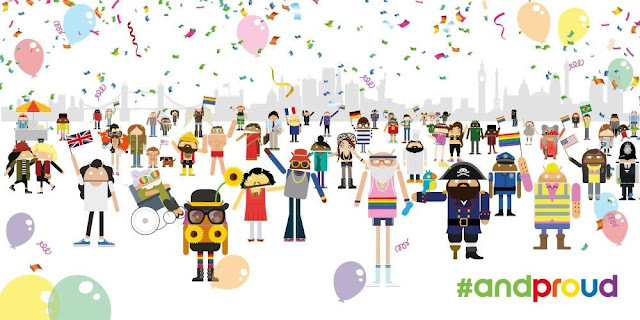 A few days ago they turned their Androidify website into a gay pride parade. You can create and Android version of yourself (actually you can create numerous versions of yourself) and then place that character into the parade. They offer an impressive array of outfits, hairstyles, and accessories to chose from. Also, you can download your character and post it anywhere you'd like without having to give out any personal info at all. They don't ask you to sign up for anything, not even a mailing list. It's pretty cool. If you do post on social media, use the #andproud tag! Anyway, if you have five minutes to waste on fun, go check out their website. And be sure to watch the video below. The parade is up for a few more days, so you best get moving! Here's some we made of ourselves and a one or two that caught our eye!